During my years of being homeschooled through high school, I was introduced to the Catholic history text books of Anne W. Carroll, published by Seton Home Study Curriculum in Front Royal, Virginia. For 9th-10th Grade, the text assigned was Christ the King: Lord of History. For 11th-12th Grade, we moved on to Christ and the Americas. These books have been pretty standard fare for Catholic homeschool students since their publication in the 1980’s, and have been given rave reviews in Catholic curriculum catalogs because of their unique approach to the historical method. In the prologue of the first volume, Mrs. Carroll explains her belief that every history book has a given perspective colored by the biases and personal opinion of the author. Hence, in her history books, she lets us know that she intends to be unabashedly proud of the role of Catholicism in the shaping of Western Civilization, and always makes the Incarnation of Jesus Christ stand center stage as the defining historical event. Likewise, she refuses to allow herself to be locked in the box of political correctness in order to win a seat in the secular market-place, and staunchly sticks with the hearty traditional “B.C.” and “A.D.” as opposed to insipid modern “B.C.E.” and “C.E.”. I admire her uncompromising boldness in declaring and defending the faith, and her ability to balance this with a fluid story-telling style. In each book, she covers a huge swath of time in a pithy manner, and while there are certain aspects I wished she’d covered instead of others, every historian must make their own call in that area. She also has a good handle on when to break up chapters into more palatable sections for students. One of the main aims of her writings is to counter-balance the “Black Legends” that have been foisted onto the story of the Church through the lingering Protestant Whig interpretation of history, and she does an admirable job of it. She explains that the Middle Ages were not half so backward as secular history books often insist, and illustrates how they sparkled with great cultural and academic achievements, borne out of cohesion and shared vision of a united Christendom. She also demonstrates the benefits of the feudal system and the concept of Christian monarchy. When focusing on the contributions of the Church in building up Civilization, and the Saints in building up the Church, she always shines. However, while the heart of her literary works is in the right place, I’m afraid that there are some noteworthy flaws with regards to making her personal opinions sound like some sort of defined “Catholic position” which does not exist. Moreover, quite a few of these frankly-expressed opinions are tainted by imbalance and inaccuracy, exchanging depth and complexity for an overly simplified version of historical events. Many of the “heroes and “villains” are far too easily designated as such without exploring the gray areas of their character or the human dimension; causes and effects are often distorted or condensed to fit a strictly religious interpretation; and the author’s own heavy-handed style and refusal to leave barely anything to the judgment of the reader has the potential to disenchant Catholics and non-Catholics alike. I don’t think this was necessarily intentional on her part, but her eagerness to counteract the lies told against the Church seems to have pushed her in the opposite direction, making for dogmatic, agenda-driven history indeed. As a freelance student of British history, I could particularly identify this in the sections dealing with happenings in the British Isles and her colonies. I shall try to list some of the areas that struck me as in need of further explanation and/or revision in hopes that perhaps these changes may ultimately be made in the Seton publication. Also, I might just indulge my own penchant for some historical story-telling elaboration, in hopes that it will prove of interesting extracurricular material. I would agree that both claimants had tenuous claims to the throne, but I don’t understand why she made it sound that William had any better claim than Harold. Upon the death of King Edward the Confessor, who died childless, there was a serious question as to who should inherit the crown. William was a distant Norman cousin of King Edward; Harold Godwinson was Edward’s brother-in-law from a powerful Saxon warrior family. Both claimed that they had been chosen by King Edward to inherit the throne. Who can say with any accuracy which had a better claim? William the Conqueror was certainly eager to be his own promotional manager, claiming that Harold had ceded any claim to the throne while he was being entertained at William’s court in Normandy and managing to receive papal backing for his invasion plans. Also, William had a wonderful way of tying himself to ancient legends and reading into omens…so for example he identified himself with King Arthur’s Britons, who had founded Brittany in France after being chased out of Britain by the invading Saxons who founded England centuries earlier. 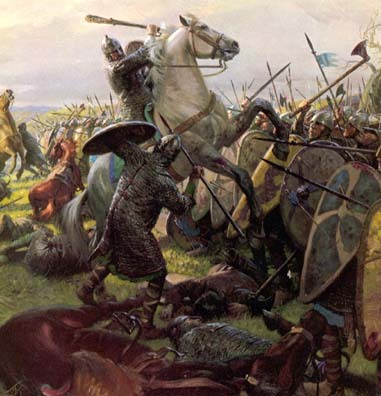 All that having been said, reasons could be given for seeing Harold as having a closer link with the spirit of King Arthur, since he was acting as a freedom-fighter defending natives of the British Isles against the invasion and ultimate suppression of foreign invaders. J.R.R. Tolkien certainly took this view, and dearly wished that the Anglo-Saxon England which inspired his epics endured unadulterated by “foreign” influence. In college, he even made a fuss about wanting to start an alternative history discussion, doing away with the whole nasty 1066 debacle! The issue of papal backing for William is pretty much irrelevant with regards to a “Catholic Perspective” on the whole event, since the papacy at the time was just as much of a political entity as a religious one, and would make political alliances that could not be held as universally binding upon the Catholic faithful. Needless to say, at this time, both Normans and Saxons were loyal children of the Church, so there really should not be spiritual overtones read into the pope’s decision on William’s behalf. Let it be known that, down the road, another pope would pay the English a similar favor in their conquest of Ireland. The rest, although the poor pope certainly couldn’t have known it at the time, is history. While on the subject of the Norman Conquest, I can’t help but wish the author had mentioned Hereford the Wake, the great Saxon outlaw hero considered to be one of the inspirations for the legends of Robin Hood in later generations. In the aftermath of the invasion, he defended his impoverished countrymen from their brutal Norman overlords, robbed from the rich and gave to the poor. And yes, he was obviously a very Catholic hero too, although he was non-too-fond of self-serving Norman clergymen, just like Robin Hood. Still, his famous super-sword was said to have been entrusted to him by Saxon monks, blessing him for his mission among the people. Hereford was said to be the son of Lady Godiva, a Saxon noblewoman from the court of King St. Edward the Confessor, whose personal piety, generosity to the Church, and charity to the poor were well-known in her day...in fact, more well-known than her ride through the streets of Coventry ostensibly “naked” (probably meaning clad only in a simple under-garment shift) to convince her husband that true beauty was a matter of inner nobility not rich garments, urging him to alleviate his heavy taxation of the people of the city. Another interesting legend from the era has to do with what really became of the would-be-king Harold after the battle. The officials retelling from the Norman ascendency was that he was killed by an arrow in the eye, and his body was dismembered by his enemies in the aftermath. Only his mistress, Edith Swan-Neck, was said to have been able to identify his remains. However, there is an alternative ending to the tale, cherished by generations of Saxon mothers who also reared their children on the adventures of Hereford the Wake. Whether or not there’s any truth in the legend, I think it’s safe to say that the above realization of what a truly meaningful life consists of could be one of the most profound epiphanies to come out of the complicated and colorful Norman Conquest. How can she possibly say that just because Henry came to the throne “by force” he was somehow illegitimate? His rise to power came out of the War of the Roses, inter-family political struggles in which every claimant was trying to take or hold the crown through aggressive means. Given all the chaos, there is certainly no logical reason for making Henry disqualified for the throne. Basically, whoever could grab it got it. As I said, I appreciate the author’s vision of Christian Kingship in this period, but the reality was often a pretty grubby business, not half as dependent upon rights of succession as the ability to gain and hold power. I must wonder, could her support of Richard be so definite because his rival, King Henry VII, was the father of King Henry VIII who tore England away from the Catholic Church? Some Catholic speculative historians have taken this line of thinking, but it really doesn’t hold up to scrutiny. In the case of Henry Tudor, it is impossible to blame him, a practicing Catholic, for the degenerate behavior of his son who would go on to betray the Church. Who’s to say that Richard III’s hypothetical son might not have done the same in the midst of the political turmoil that accompanied the Protestant Revolt in the aftermath of a national civil war? The singing inspired fighting, and even many Welshman who had sworn fealty to Richard quickly doubled back on their word to fight for Henry. One Welsh nobleman had even declared that horses would have to gallop over him before he would betray Richard…and then promptly lay underneath a bridge so that horses could indeed “gallop over him”, freeing him from his oath so he could join Henry’s army! The young would-be-king was ecstatic at his popularity among the people of Wales, and took the Welsh St. Arnel (said to have banished a dragon deep into the mountains of Cymru) as his patron, who he later claimed had saved his ship from a terrible storm before he finally safely landed in Milford Haven. But with or without all these promotional pluses, many contemporaries were thrilled by the young Henry’s overthrow of King Richard, a man many thought to be ruthless and power-hungry, even willing to illegitimize and possibly murder his nephews in order to take the throne “by force”! So the nursery rhyme goes: “The cat, the rat, and the level dog (Richard’s cronies) rule all England under the hog (a part of Richard’s coat-of-arms)”. Of course, whether he was the monster portrayed in the works of Sir Thomas More and William Shakespeare is highly debatable, and the recent discovery of his remains and their internment in Leicester Cathedral has set the stage for a more balanced evaluation of the man. But at best, he was mixed, and there are enough valid reasons to suppose that at least a portion of the accusations against him are worthy of belief. My personal opinion on Richard is that he was an intelligent and ambitious individual, who did indeed have his eye on the throne, and may have used some scurrilous means of obtaining it. But once in power, he proved to be a fairly competent and conscientious ruler, improving the justice of the courts, generously supporting the church, and impressing visitors with his hospitality and excellent conversation skills. But he could also be brutal clinging on to power, and he made his fair share of enemies for his good and bad points alike (trying to clean up judicial corruption often has nasty repercussions…), leading to his overthrow. But my opinion aside, it is the very spirit of open-minded debate and discernment that is essential to historical studies, and should never be shut down by an author’s opinion validated by imaginary religious mandate. Also, while in the mode of discussing the War of the Roses, it would have been interesting to have been introduced to two other characters from the era that I think would have made wonderful reading in a Catholic history text, both of which were on the Lancastrian side. One was the saintly yet ill-advised King Henry VI, who Richard III’s brother, Edward IV, brutally deposed, imprisoned, and most likely assassinated. This much-maligned monarch was a man out of step with his time because he was too far ahead of it. He wanted to end the ongoing wars with France, and had a vision for England to become a center of learning and the arts, a repository of culture and higher education that would attract the admiration of all Christendom. He founded King’s College in Cambridge, and designated the organization of King’s College Choir, whose glorious music continues to be one of the jewels of British culture. He despised the barbarities and his age and the loose morals of the court, and strove to do away with the moral obscenities around him and end capital punishment for his fellow Christians within his realm. Unfortunately, he was far from politically savvy and far too trusting of those around. After being overthrown, he had a nervous break-down, but bore all of his sufferings in prison with great resignation and dignity, asking only that he be allowed the Eucharist, his prayer books, his pet canary, and pet lap dog for comfort. After the gentle king was “found” dead, many of the common people began to pray to him for intercession, believing that he had been murdered and, in a sense, martyred by the power-hungry and corrupt. The cause for his canonization was begun, but unfortunately King Henry VII proved too cheap to carry it to fruition, and Henry VIII’s little apostatizing escapade killed it stone dead. But nevertheless...I for one would like to see the cause reopened! The other character of note from the era was the formidable Margaret Beaufort, Henry VII’s mother. A short and sturdy little girl, and one of the last hopes for the House of Lancaster to make a come-back after their multiple reverses of fortune, she was married at age 12 and gave birth to her son at age 13. Her small son had to be taken away from her and spirited off to France for fear of him being assassinated by the Yorkists, and Margaret would later disguise herself in man’s apparel in order to visit him. Later, when Henry made his bid for the throne, Margaret worked behind the scenes in the royal court, winning support for him and assuring that the coup would be successful. In spite of her various intrigues on behalf of her kith and kin, she was a very pious woman, known for being actively involved in Church affairs and giving generously out of her coffers. Her chaplain in later years was Bishop John Fisher of Rochester, who would be martyred under her off-the-rocker grandson, Henry VIII, who had by then usurped the title “Head of the Church in England”. I would have loved to have had granny around to give him a piece of her mind during the proceedings…and a good whacking with a royal wooden spoon to boot! Thanks for these comments about Anne Carroll's books. I have never read them and have often wondered about them! Happy Pentecost Sunday! Happy Pentecost, O Excellent Pearl! I esp. liked reading about Hereward the Wake. I hope you will write more about him. @Stephanie A. Mann: Thank you so much for reading and commenting! It's an honor, as you're own work on the English Counter-Reformation is truly far-reaching and impressive. Yes, Anne Carroll's books were unfortunately a bit of a let-down for me in a number of major areas, but perhaps a new generation of Catholic historians will decide to produce an updated set of texts that are more balanced overall.